When Sonora wandered across the border from Mexico into the United States last March, she didn't know what she was heading into. As a wolf, she couldn't know that the US Fish & Wildlife Service (USFWS) had been pondering how to recover Mexican wolves in the states of Arizona and New Mexico since 1982, when there were no wild wolves left in the Southwest. She couldn't know that USFWS was facing widespread opposition from ranchers over its plans to reintroduce her subspecies – a strain of the grey wolf that once roamed across most of North America. Or that conservation groups had filed their own lawsuit under the Endangered Species Act to demand that UFWS complete a recovery plan ensuring that she and her offspring could thrive. In late November, the agency finally completed that plan. But the controversy isn't over yet. Sonora was only ten months old when she made the long trek from Chihuahua, Mexico to private ranchland in the Chiricahua region of southern Arizona. She had travelled more than 90 miles (140 km) and arrived alone and undoubtedly hungry. For several days, she was spotted by a wildlife manager from the Arizona Department of Game and Fish, as well as local ranch-hands. She had spent half of her life in captivity – born at a captive-breeding centre in Cananea, Mexico – so perhaps it's not surprising that she didn't seem too perturbed when people tried to scare her off the ranch. Only five months earlier, Mexico's Comisión Nacional De Areas Naturales Protegidas (CONAP) had released her and her family with the optimistic hope that her pack would thrive. It didn't. So Sonora wandered north though patchy habitat until she reached the US. But failing to flee at the sight of humans in Arizona was a mistake. Particularly when ranchers reported livestock killed in the area. Wildlife officials determined that a wolf had killed at least one of those animals and Sonora was the prime suspect. So, soon after she crossed the border, she was promptly recaptured. As a potentially fertile female Mexican wolf, Sonora is extremely valuable. With no other wolves at the Arizona border, she was transferred to a holding facility at the Sevilleta National Wildlife Refuge in New Mexico, where she stayed until November. Then, USFWS moved her to the Sedgwick County Zoo in Kansas, one of more than 50 captive-breeding facilities scattered throughout the US and Mexico where wolf DNA is closely examined and wolf mating carefully planned. That's because the roughly 400 Mexican wolves alive in the world today – most of them in captivity – are descended from only seven animals that survived the American slaughter of predators for centuries. If the subspecies is to stand a chance at recovery, every pairing must be carefully engineered to minimise inbreeding and maximise what little genetic diversity remains. Because Sonora is from Mexico, she brings valuable new genes into the US population. And according to USFWS biologist Maggie Dwire, she pairs well with the males at Sedgwick. A few weeks after Sonora's transfer, I shivered in the cold dark of a December dawn at Sevilleta along with about two dozen volunteers helping USFWS biologists oversee the capture and transfer of four other captive wolves to another facility: a mated pair and their two teenage pups. In the one-acre enclosure, we humans formed a formidable walking wall of boards, nets and poles, to scare the wolves into their wooden den. The pups hid first – seeking refuge in the den together. But they were no match for the transfer team. Muzzled and hooded, they endured the blood samples, physical exam and shots administered by the team. Then they were lifted into crates on the back of a pickup truck for a three-hour ride south. The parents were harder to corner, but soon they too were on their way. Once settled in their new home, they would likely breed again, with some of their offspring "cross-fostered" with wild wolves. Cross-fostering captive pups with wild ones helps reduce the controversy surrounding wolf reintroduction, according to Dwire. "When releasing a captive pack, you need to find an area without an existing pack. And you're introducing a naïve adult wolf with pups into the area," she notes. "But with cross-fostering, you just add two more pups from captivity to a wild wolf. This eliminates the naïve component and eliminates putting wolves where they weren't before." I was at the Sevilleta facility just one week after USFWS released its final recovery plan. More than 100,000 Americans had submitted comments on the draft plan in previous months, the vast majority supporting the reintroduction of wolves into the wild. But that part of the equation was no longer in question. 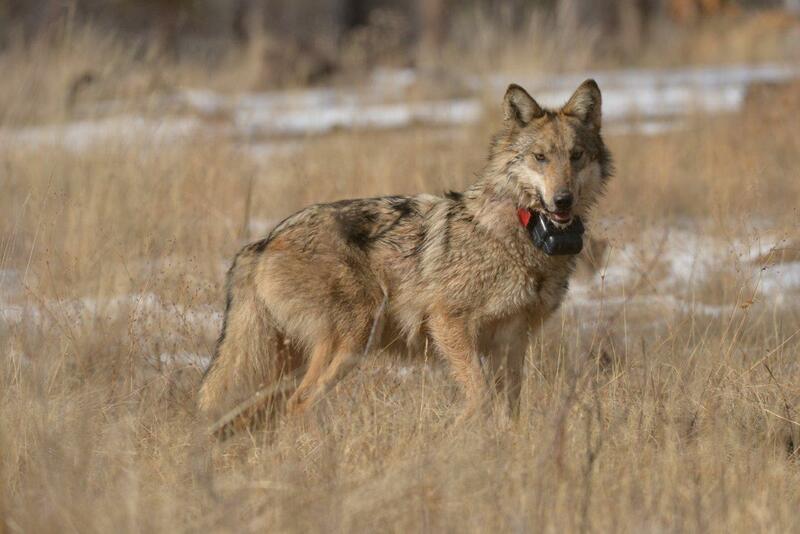 USFWS has been releasing captive-bred wolves into an "experimental population area" south of Interstate Highway 40 in Arizona and adjacent New Mexico since 1998. By 2016, those wild wolves numbered 113 across both states. 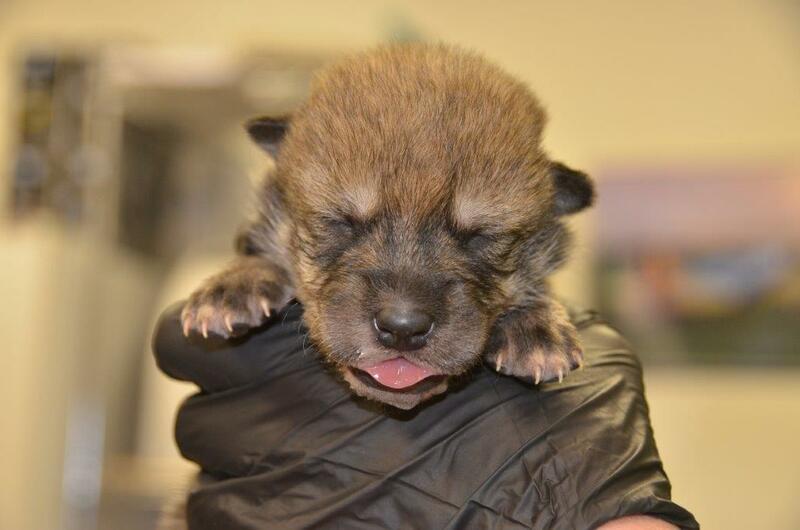 Since 1998, the US Fish & Wildlife Service – the agency responsible for the Mexican wolf's recovery – has been releasing captive-born individuals into an "Experimental Population Area" south of Interstate 40, the highway that slices through Arizona and New Mexico. But there were other urgent questions that remained. How many wolves would it take to recover the subspecies? How many populations are needed? Would they be allowed to roam north of the highway? With wolf numbers even lower in Mexico, won't populations on both sides of the border need to mix if the subspecies is to survive? And what about that border wall President Donald Trump wants to build? In general, ranchers and hunters call for fewer wolves in a smaller area. Wolves prey on livestock and hunt wild elk as a mainstay of their diet. In contrast, conservationists want more wolves with additional populations in northern Arizona near the Grand Canyon and up into the states of Utah and Colorado – far north of the current Interstate 40 boundary. They cite a previous draft recovery plan from 2012 that called for three separate populations in the US totalling at least 750 wolves across the states of Arizona, New Mexico, Utah and Colorado to allow Mexican wolves to recover. But all four governors of those states oppose any reintroductions north of Interstate 40, maintaining that the southern region, combined with habitat in Mexico, represents the wolf's historical range. Both the Arizona and New Mexico Game and Fish Commissions, which set wildlife policies in their states, have voted in recent years to deny releases of wolves. Conservationists and many wolf biologists, meanwhile, cite genetic analyses suggesting that the Mexican wolf's historical range spread far beyond the limited area identified by USFWS and the states. They argue that as the climate changes, Mexican wolves will need the freedom to expand into prime stomping grounds farther north. And they note that habitat in Mexico is questionable: it's largely private ranchland, not public, with scanty data on available prey and lots of illegally killed wolves. People like Sisto Hernandez walk the middle ground. Hernandez is a member of the White Mountain Apache Tribe in Arizona – an official partner in the recovery effort – and is the tribe's range management specialist. Much of the tribe's economy depends on ranching. He chairs the Mexican Wolf/Livestock Coexistence Council, a public-private effort involving ranchers, conservationists, tribes and counties that helps ranchers live alongside wolves. "People don't have to love the wolf," says Hernandez. "They just have to feel they can live with it." Members of the council have differing views on the wolf, but they've committed to work together on three goals: healthy western landscapes, self-sustaining wolf populations and viable ranching. "We do a lot better when we help each other," says Hernandez. With the help of federal funds, the council goes beyond traditional programmes that compensate ranchers for the loss of livestock to wolves. It pays ranchers within wolf territory even if they don't lose any animals, and it encourages management actions that reduce livestock-wolf conflict. That includes increasing human presence through their range-riders programme. "[Range riders] isn't just cowboy work," Hernandez told me. "It's about knowing where the wolves like to be, their dens, trails, roads they are likely to use. Range riders have to know what to anticipate to help ranchers make management decisions that lessen the likelihood of conflict. It's not an easy job. It takes the right person to do it." Each year, the council also pays ranchers in wolf territory based on how many conflict-avoidance measures a rancher enacts and – perhaps most importantly – the number of wolf pups that survive on the ranch. Although many consider the initiative a success, not everyone has bought into it. The council keeps the names of ranchers who apply for assistance anonymous in order to avoid reprisals from what Hernandez calls "extremists" on both sides. "There are people who can make things difficult and we don't want to discourage [rancher] participation because [they fear] people might cut their fences, make threatening phone calls, or do worse things to sabotage their ranch." That's the world Sonora wandered into last spring. Final recovery or more controversy? 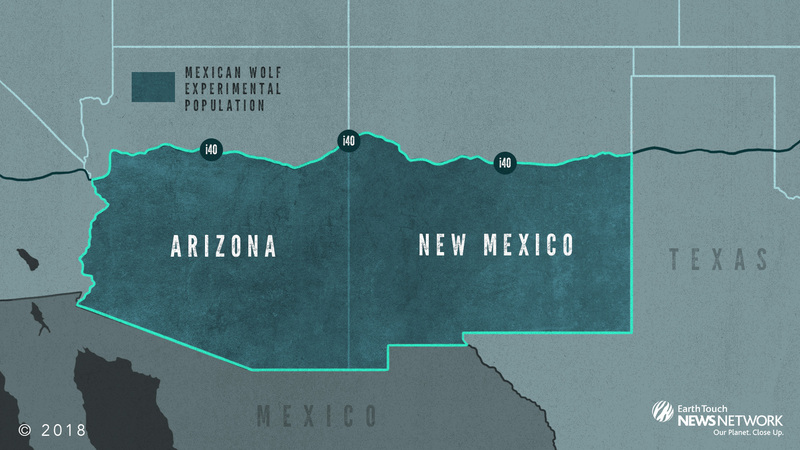 The precise limits of the Mexican wolf's historical range are not clear, but many experts say it spread far beyond the limited area of Arizona and New Mexico identified by USFWS, including as far north as Colorado. The final recovery plan released in late November scales back the recovery goals recommended in 2012. In it, USFWS maintains that only two populations of wolves would be needed to "ensure a 90 percent probability of persistence over 100 years" – rather than the three populations determined by scientists in 2012. 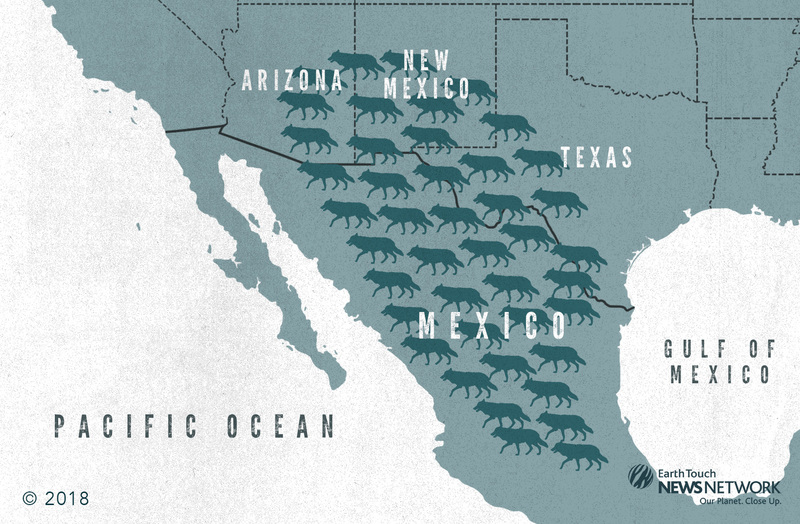 The two populations would consist of 320 wolves in southern Arizona and New Mexico, plus a smaller population of 200 in the Sierra Madre Occidental Mountains in Mexico, managed by CONAP. The US population would be limited to southern Arizona and New Mexico, south of Interstate 40. Draft recovery-planning documents suggest that USFWS considers 320 animals to be what it calls the level of "social tolerance" for wolves. Conservation groups call it caving to the states. On January 30th, several groups sued the agency for, as they claim, violating the Endangered Species Act. Moreover, under the final plan, the US and Mexican populations won't even have to be connected. The agency expects few wolves will cross the questionable habitat between the Sierra Madre Occidental Mountains in Mexico and the US border, at least not enough to ensure adequate gene flow. If that dispersal were completely stopped – such as by a border wall – the impact would be minimal, according to USFWS. To compensate, it intends to continue its intensive, hands-on breeding programme and translocations, what it calls "artificial or assisted connectivity". Sonora seems to be an outlier – one of only a handful of natural dispersals across the border in recent years. For now, she'll remain in captivity, to breed pups that might or might not roam the wilds of the American Southwest. Meanwhile, with fresh legal challenges now facing it, the recovery plan remains in limbo. And the centuries-old feud between rancher and predator continues. But there is hope. "Just remember," Hernandez told me as we ended our conversation, "we're not all like that." The last surviving wolf of the most celebrated pack in Yellowstone National Park's history has been killed, legally, by a hunter in Montana.